The current controller is applicable for field-oriented control. In the control according to V/f characteristic the current controller is only applicable for the function Flying Start. The inner control loop of the field-oriented control comprises two current controllers. The field oriented control thus impresses the motor current into the machine via two components to be controlled. By separate regulation of these two parameters, a decoupling of the system equivalent to an externally excited direct current machine is achieved. The VFD setup of the two current controllers is identical and enables joint setting of amplification as well as the integral time for both controllers. For this, the parameters Amplification and Parameter Integral Time are available. The proportional and integration and component of the current controllers can be switched off by setting the parameters to zero. The variable frequency drive guided commissioning has selected the parameters of the current controller in such a way that they can be used without having to be changed in most applications. If, in exceptional cases, an optimization of the behavior of the current controllers is to be done, the reference value jump during the flux-formation phase can be used for this. The reference value of the flux-forming current components leaps to the figure Current during Flux-Formation with suitable parameterization and then changes controlled to the magnetizing current after the expiry of the Max. Flux-Formation Time. The operating point necessary for the adjustment demands the setting of parameter Minimum Frequency, as the VFD is accelerated after magnetizing. 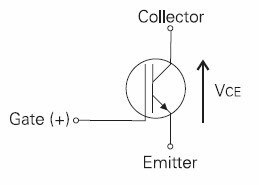 The measurement of the jump reply, which is defined by the ratio of the currents mentioned, should be done in the motor supply line by means of a measuring current transformer of a sufficient bandwidth. The internally calculated actual value for the flux-forming current component cannot be output via the variable frequency drive analog output for this measurement as the time resolution of the measurement is not sufficient. To set the VFD parameters of the PI controller, the Amplification is increased first until the actual value overshoots distinctly during the control process. Now, the amplification is reduced to about fifty percent again and then the Integral Time is synchronized until actual value overshoots slightly during the control process. The VFD settings of the current controllers should not be too dynamic in order to ensure a sufficient reserve range. The control tends to increased oscillations if the reverse range is reduced. The dimensioning of the current controller parameters by calculation of the time constant is to be done for a switching frequency of 2 kHz. For other switching frequencies, the values are adapted internally so that the setting can remain unchanged for all switching frequencies. The dynamic properties of the current controller improve if the switching and scanning frequency increases. For an asynchronous motor and synchronous motor, the coupling between the flux-forming current Isd and the torque-forming current Isq can be undone largely by the activated cross-coupling compensation. In this way, it is possible to impress the torque-forming current in the machine more quickly and the speed control circuit has a lower tendency toward vibration. The cross-coupling exists between the flux-forming current Isd and the torque-forming current Isq and is caused by the voltage drop at the stator inductivity and the stator leakage inductivity. For this reason, the cross-coupling increases with the stator frequency. The cross-coupling becomes particularly apparent in the case of high stator frequencies at relatively small switching frequencies (e.g. 300 Hz stator frequency at 4 kHz switching frequency), as with small switching frequencies, the current controller slows down. The variable frequency drive sensorless field oriented control for ASM and the sensorless field oriented control for PSM can be used for sensorless torque control alternative to the speed control. The torque control is usable above the VFD Frequency Limit. Below the VFD Frequency Limit the current impression is active with the current reference frequency as reference value. In this case the torque is not controlled, but results depending on the load and the Starting current. To achieve a starting in torque control, the reference frequency should be set higher than Frequency Limit. This is guaranteed in example by setting Minimum frequency > Frequency Limit. The variable frequency drive energy saving function shouldn't be used when using the Torque controller, since it influences the control dynamics significantly. In many cases limitation of the speed is required in the operating points with reduced or without load torque, because the speed regulates itself to the torque reference and the load behavior. To avoid an unintentional speed (mostly too high speeds, in some cases also too small speeds and avoidance of current impression), the frequency is limited by Frequency Upper Limit and Frequency Lower Limit by the speed controller. As from the limit value the VFD is controlled to maximum speed, which corresponds to the behavior of the speed controller. Additionally, the controller limits the speed to the VFD's Maximum Frequency. This limitation is set by the speed controller – changes in the speed controller affect the speed behavior in the limit area of the 3 mentioned parameters. If the torque control is activated while the actual frequency lies outside the defined range (in example when switching on a stopped machine or when the Flying start synchronizes), the allowed frequency is driven to without ramps. The torque is only limited by the limitations of the speed controller (current and torque). Therefore an unexpected dynamic behavior can occur. The control of the torque-forming current components is done in the outer control loop by the speed controller. Via VFD parameter Operation Mode, you can select the operation mode for the speed controller. The operation mode defines the use of the parameterizable limits. These are referred to the direction of rotation and the direction of the torque and depend on the selected configuration. The optimization of the speed controller can be done with the help of a reference value leap. The amount of the leap is defined by the set ramp or limitation. The optimization of the PI controller should be done at the maximum admissible reference figure change rate. First, the amplification is increased until the actual value overshoots distinctly during the control process. This is indicated by a strong oscillation of the speed and by the running noises. In the next step, reduce the amplification slightly (1/2 ...3/4 etc.). Then reduce the integral time (larger I component) until the actual value overshoots only slightly in the control process. If necessary, check the VFD speed control settings in the case of dynamic operations (acceleration, deceleration). The frequency at which the switch-over of the controller parameters is effected can be set via variable frequency drive parameter. The acceleration pre-control controlled parallel to the speed controller reduces the reaction time of the VFD system to a change of reference values. The acceleration pre-control is active in the speed-controlled configurations and can be activated via VFD parameter. 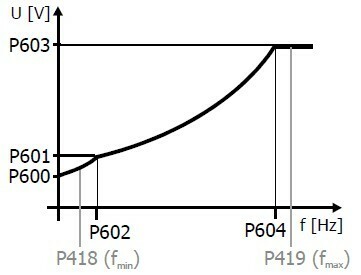 The minimum acceleration time defines the modification speed of the reference speed value as from which a torque necessary for acceleration of the VFD is pre-controlled. The acceleration of the mass is a function of the Mech. Time Constant of the system. The value calculated from the increase of the reference value and the multiplication factor of the torque required is added to the variable frequency drive output signal of the speed controller. For optimal setting, the acceleration pre-control is switched on and the mechanical time constant is set to the VFD minimum value. The output value of the speed controller is compared to the minimum acceleration time during the acceleration processes. The frequency ramp is to be set to the highest value occurring in operation at which the output figure of the speed controller is not yet limited. Set the variable frequency drive value of Minimum Acceleration to half the set acceleration ramp. In this way, it is ensured that the acceleration pre-control becomes active. During several acceleration attempts, increase the Mech. Time Constant until the output value during the acceleration roughly corresponds to the torque-forming current Isq. In the case of VFDs with a high friction or other high resistance torque, deduct the corresponding portion from the torque-forming current Isq before. This setting should also minimize overshooting of the speed controller. Alternatively, you can calculate the mechanical time constant at a known mass moment of inertia. The mechanical time constant is the time the VFD needs during acceleration from standstill with rated torque applied until the Rated Speed is reached. Please note, that changes within the Field controller parameters should only be done in the basic speed area. The limits of the variable frequency drive field controller define not only the maximum current occurring, but also the dynamic properties of the controller. The upper and lower limits restrict the modification speed of the motor flux and the torque resulting from it. In particular the speed area above the nominal frequency should be observed for the modification of the flux-forming component. The upper limit is to be estimated from the product of the set magnetizing current and the correction factor Flux Reference Value, although the limit must not exceed the overload current of the VFD. The modulation controller, which is designed as an I regulator, automatically adapts the output value of the variable frequency drive to the machine behavior in the basic speed area and in the field weakening area. If the modulation exceeds the figure set with parameter Reference Modulation, the field forming current component and thus the flux in the machine are reduced. 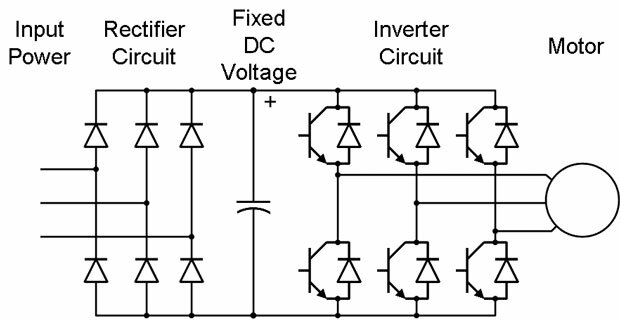 In order to make the best possible use of the voltage available, the figure selected via parameter Operation Mode is put into proportion to the DC link voltage. That means that with a high mains voltage there is also a high output voltage available, the VFD only reaches the field weakening area later and produces a higher torque. The percentage setting of the Reference Modulation is basically a function of the leakage inductivity of the machine. The variable frequency drive default value was selected such that in most cases the remaining deviation of 5% is sufficient as a reserve range for the current controller. For the optimization of the controller parameters, the VFD is accelerated with a flat ramp into the area of field weakening, so that the modulation controller intervenes. The limit is set via parameter Reference Modulation. Then, the control loop can be excited with a jump function by modifying the reference modulation (changeover between 95% and 50%). By means of an oscillographed measurement of the flux-forming current component on the analog output of the variable frequency drive, the controlling process of the modulation controller can be assessed. The course of the signal of the flux-forming current Isd should reach the stationary value after overshooting without oscillation. An oscillating of the course of the current can be damped by increasing the integral time. The output signal of the modulation controller is the internal reference flux. The controller output and the integrating part are limited via the parameter Reference Imr Lower Limit or the product of Rated Magnetizing Current and Flux Reference Value. The magnetizing current parameter forming the upper limit is to be set to the rated value of the machine. For the lower limit, select a value which also builds up an adequate flux in the machine in the field weakening area. The limitation of the control deviation at the output of the modulation controller prevents a possible oscillation of the variable frequency drive control loop in the case of load surges. The parameter Control Deviation Limitation is stated as an absolute value and acts both as a positive and a negative limit.